1 Price Lock Guarantee: As long as you remain a customer in good standing, we guarantee your renewal cost will never increase! 2 AccuZIP Inc. receives weekly NCOALink updates. Not sure how adding mailing services to your business can help you? 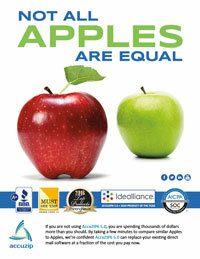 Download our Apples to Apples comparison chart. Scan the QR code or follow the link from the comparison chart to watch our fun video that shows you the Top 7 Reasons to Add Mailing Services. Many thanks for your support on this holiday. As always, Accuzip Tech Support comes through when I need you.